Yesterday during a special celebration held at the Ritz Paris Hotel, Alber Elbaz and Didier Steudier, Chef of Ritz Paris congratulated the winners of the Lanvin online contest for “The Best Chocolate Cake Recipe”. Mother and daughter team Charlotte Rock and her 7 ½ year old daughter Rose Beaudoin were the winners of the contest and received the prize of an exclusive children’s cooking course at the Ritz Escoffier School in Paris. The winning chocolate cake was served at an exclusive Children’s Tea Party, thrown in celebration of the Lanvin Petite Collection and its debut in boutiques. Kids and their families enjoyed a day filled with children’s amusements, colorful candies, a waffle and crepe making station, a balloon sculpturist and a traditional French marionette show. 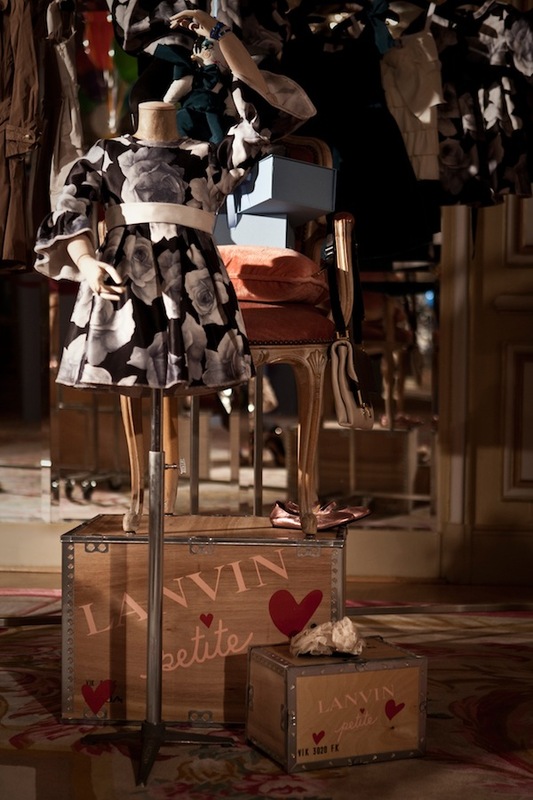 As the children played hide and seek amongst the oversized Lanvin Blu boxes, parents enjoyed tea and French pastries while admiring the new Summer 2012 Petite Collection which was arranged in a kaleidoscope of bright colours and displayed in the spectacular Louis XV salon. As a parting gift for all the kids, each family left the event with an exclusively designed Lanvin Petite coloring book and a set of coloring pencils. Links We Love: Is It Harder To Shop For Hanukah Than For Christmas? UTales & More!